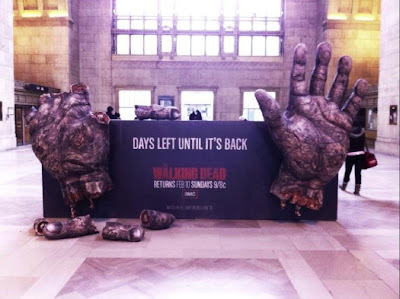 The Walking Dead fans were excited about its long-awaited return this past Sunday, and this countdown to its return is was the perfect installation to promote it. A large installation with the date of the season premier and hashtag #TWDFEB10 was bookended by two giant 'zombie' hands with rotting fingers. Zombies were also chained to it, and people could take a picture with it and share it.